The 14th Century Parish Church of St Peter and St Paul stands on the banks of the River Great Ouse and its spire dominates the southern approach to Olney. St Peter and St Paul is an Anglican church with a large congregation and welcomes many tourists each year. "I never crow but stand to show whence winds do blow. 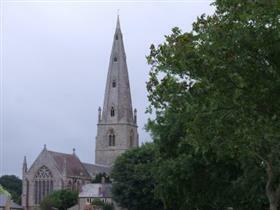 1829".The top of the spire was restored in 1884 and is a different colour. The spire reaches a height of 185 feet [56.5 m.]. Regular Sunday Service times are 10 am and 6 pm.